Hidaka interviews our customers about their needs and production methods and places great importance on intensive communications with them. As a result, it is possible to give shape to the performance and quality required by our customers. As we think highly of “what are truly required by our customers.” we can offer the best-suited system proposal to meet customer’s requirements by repeatedly making proposals. Even if the most difficult requests and seemingly impossible concepts are given to us, we are willing to receive them as valuable insights and/or important information and do our best to materialize them. In the design stage, we willingly push forward for increasingly complex and precise product configurations and innovative production process/new system development by combining newly developed technologies with abundant experience and accumulated expertise Hidaka has now. During this stage, we conduct repeated design reviews using structure simulation analysis with 3D CAE to make incremental improvements. As a result, a design with optimal performance can be finally achieved. In the manufacturing stage, experienced and skilled operators apply their unexcelled techniques by means of high-precision machine tools in a dedicated zone where the temperature and humidity are maintained at a constant level all year round to machine and assemble products of uncompromised quality. All finished products undergo quality and historical management under ISO 9001, the international standard for quality management. 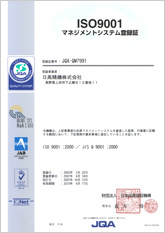 In this way, we can continuously improve quality . “Do the finished products meet the customer's performance and quality requirements?” In the verification stage before shipment, thorough test running is conducted at a dedicated trial zone under the same production conditions as those at the customer's site. If the test running indicates that any further adjustments or improvements are necessary in the light of customer satisfaction, we conduct further reviews by backing to the design stage. This is how Hidaka implements the PDCA cycle for performance and quality. Hidaka's service and support extend beyond completion of delivery to the customer's site, so that our customers around the world can keep using our products with confidence.. From our headquarters in Japan and overseas offices in China, North America and Thailand, we provide rapid services including emergency assistance, facility maintenance, and information exchange. Any kinds of requests from our customers are most welcome. In order to deliver quality and satisfaction that exceed customers’expectations, we have acquired ISO 9001:2000 certification, the international standard for quality management. We continue to meet our customers' expectations by manufacturing and delivering products of high quality, utilizing the strong technical capabilities and reliability of Hidaka— true and excellent technology company.